FILE - Kevin Systrom, CEO and co-founder of Instagram, prepares for Wednesday's announcement about IGTV in San Francisco, June 19, 2018. The founders of photo-sharing app Instagram announced Monday they would be leaving parent company Facebook to explore other ventures. Their resignation follows rumors of tensions with Facebook CEO Mark Zuckerberg. The announcement is yet another bump in Facebook’s recent turbulence, which has faced criticism over the spread of fake news, alleged exploitation of user data with third parties, electoral interference, and its use as a platform for radical leaders to spread propaganda in developing countries. 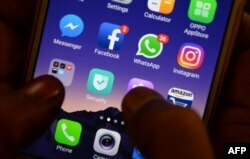 FILE - Apps for WhatsApp, Facebook, Instagram and other social networks are seen on a smartphone in Chennai, March 22, 2018. Systrom and Krieger founded Instagram in a San Francisco garage after meeting in 2010. Two years later, with 13 employees and 30 million registered users, they sold it to Facebook for $715 million. Now one of Facebook’s most profitable sources of ad revenue, Instagram boasts, more than a billion users and recently was estimated by Bloomberg to be worth upwards of $100 billion. This the second time recently that leadership from one of Facebook’s acquired properties has stepped down. WhatsApp founders Brian Acton and Jan Koum left in 2017 and 2018, respectively, following a dispute with parent company Facebook over digital advertising on their platform. Some commentators said they expected Instagram to become less independent and more integrated with Facebook following the departure of Systrom and Krieger.